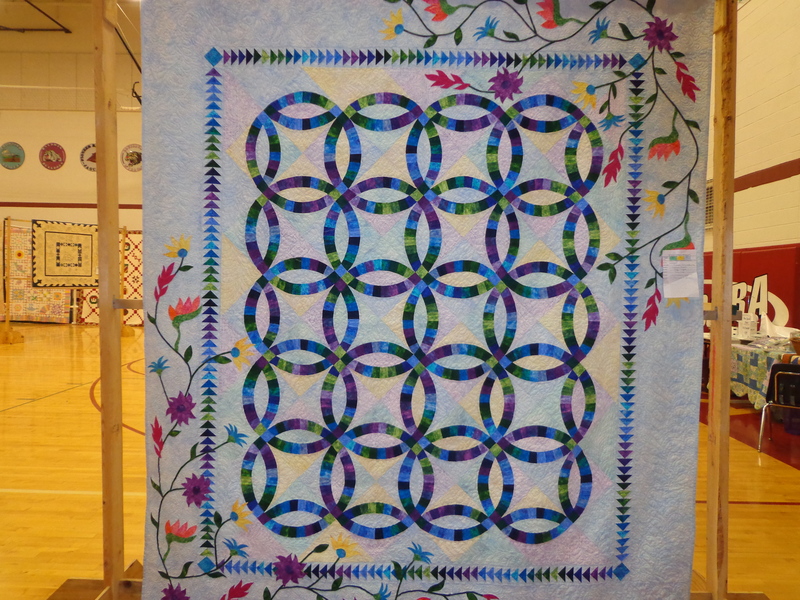 Last weekend we had our quilt show and I am finally starting to get pictures transferred from my computer to the internets. I think I took over 300 pictures, so this big task has been looming over my head for a while. So I’ve been hanging out and quilting instead. 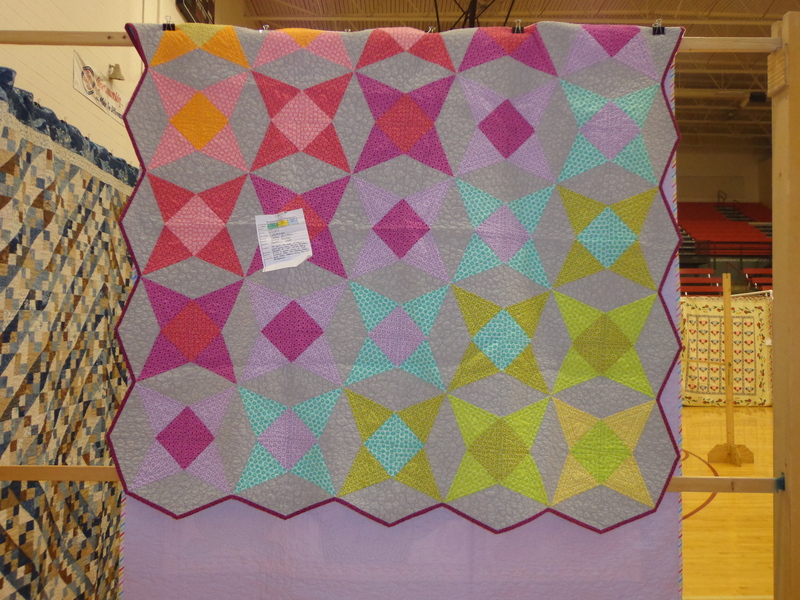 But as the quilt show post is the first ‘blog post UFO’ I’ll work through some of those pictures first. 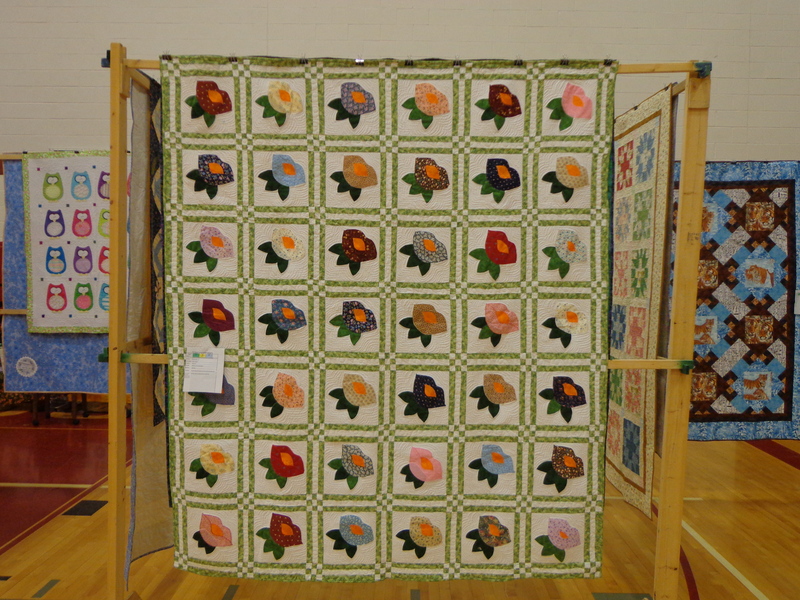 We had 3 major categories of quilts, small quilts, twin quilts, and queen/king quilts. All determined by size. I’m going to start off with pictures of the middle sized quilts as they were first to be photographed. Well at least the ones that got in on that side of the show. 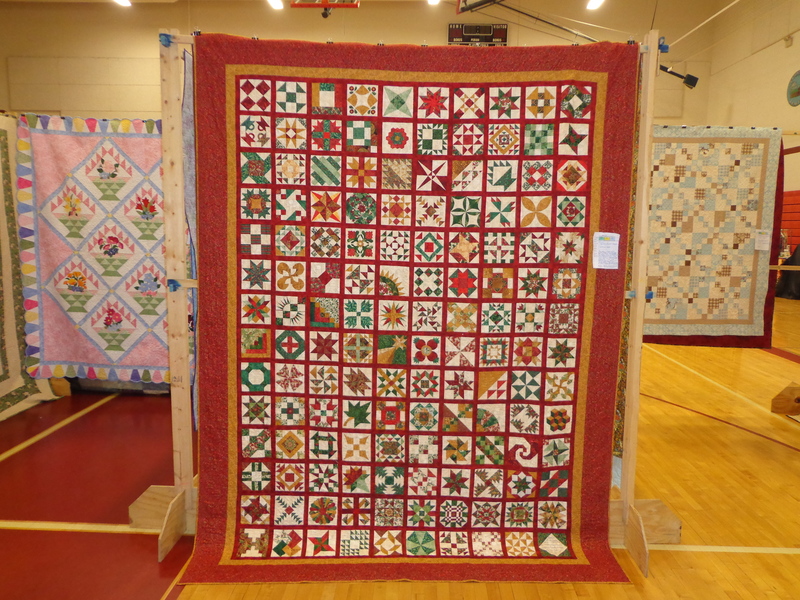 There were a few smaller and larger quilts thrown into this section of the show. First is the DWR (Double Wedding Ring Quilt). 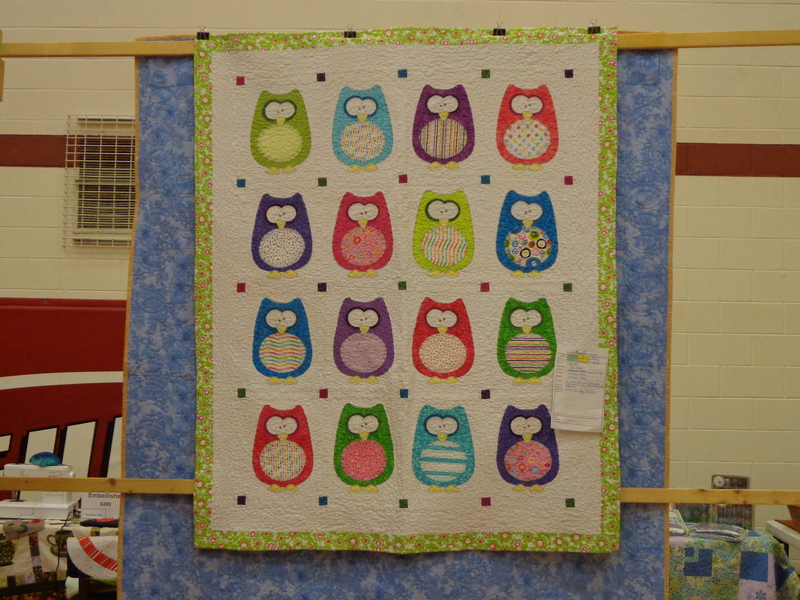 Applique is not a stranger to members of this guild and adds to this quilt quite a lot. Done by the guild president. 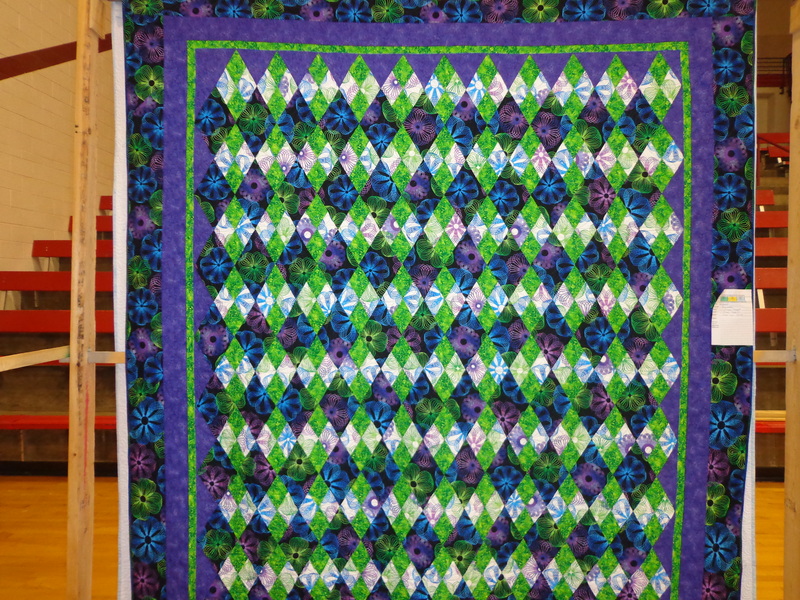 I liked this quilt, it is funky colors. And triangles. Lots of triangles. Half Square Triangles. 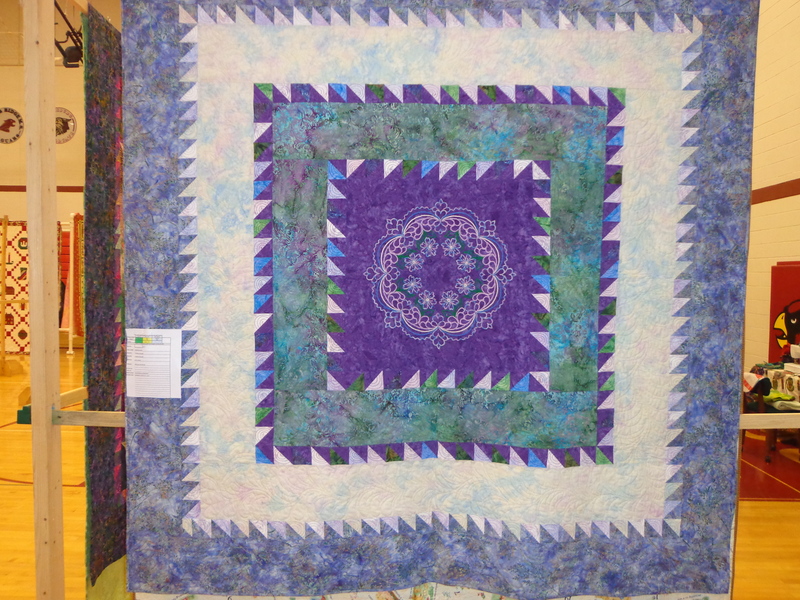 This quilt is by our quilt show coordinator most years and designer. 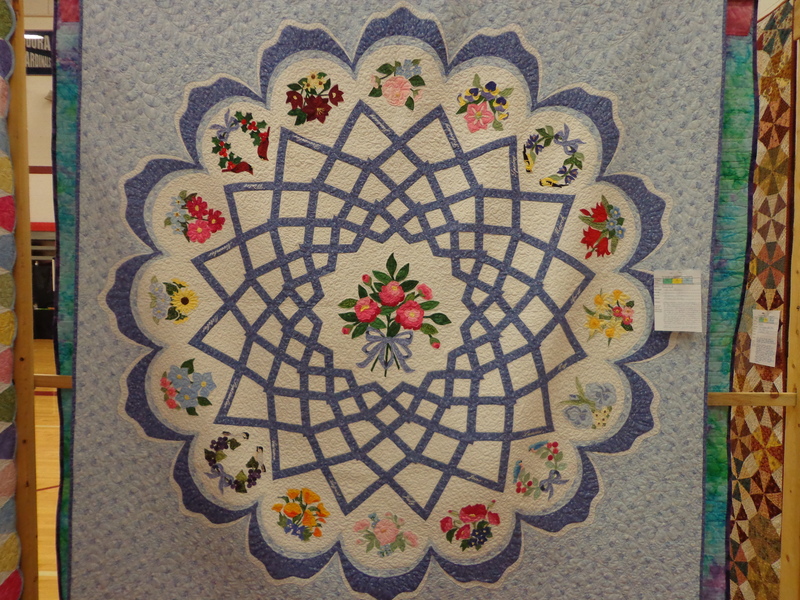 This quilt has been seen in the local quilt shop before. She probably has a pattern for this quilt. This is just amazing amount of piecing and work. This was part of a two and a half year project and/or class/and or BOM (I wasn’t part of it) and there are several ladies who tackled this pattern. The name escapes me right now, but I do remember it’s not Dear Jane, but one of the other ones like it. This quilt is a paper pieced version of a BOM that I wanted to do in dark blues. I have loved this pattern for years. 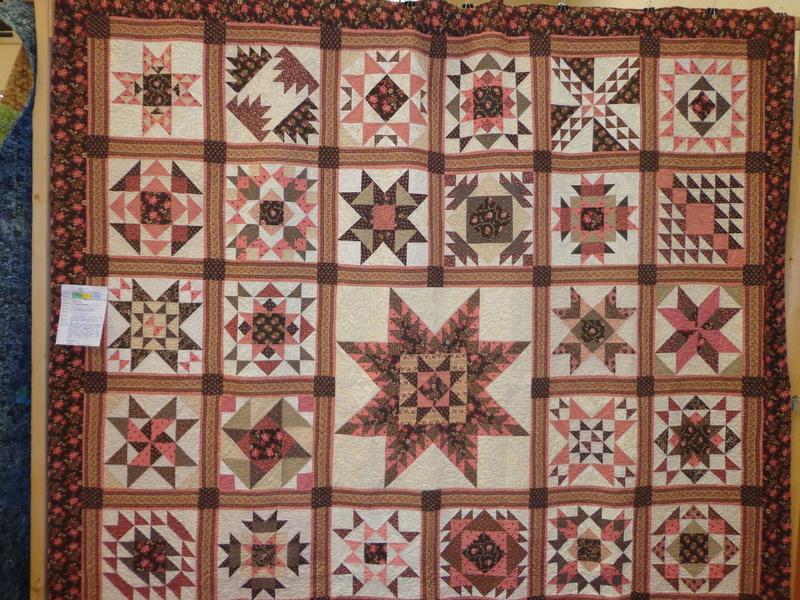 Somehow I think this was hung such that I couldn’t get the full quilt in the picture sadly. I have always liked the “Priscilla style” blocks in EQ and love the edging on this very modern looking quilt. This was one that we folded in order to binder clip the quilt to the backside. I hope this quilt survived the fold okay after it was taken down (didn’t see, too much else going on). 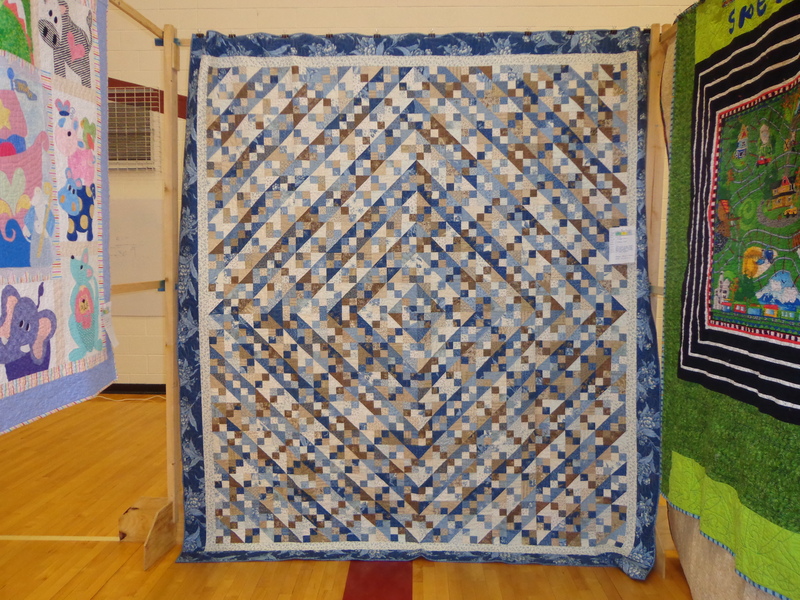 Love the subtle blues and browns in this quilt. Not my colors in particular, but it was one of the guild pass around Pizza Box blocks and I made two of the blocks for this little guy! Turned out great with the sashing! I like the mountain feeling this quilt gives! Wild colors, and the black spirograph fabric is wonderful! This was one of our minglewoods. 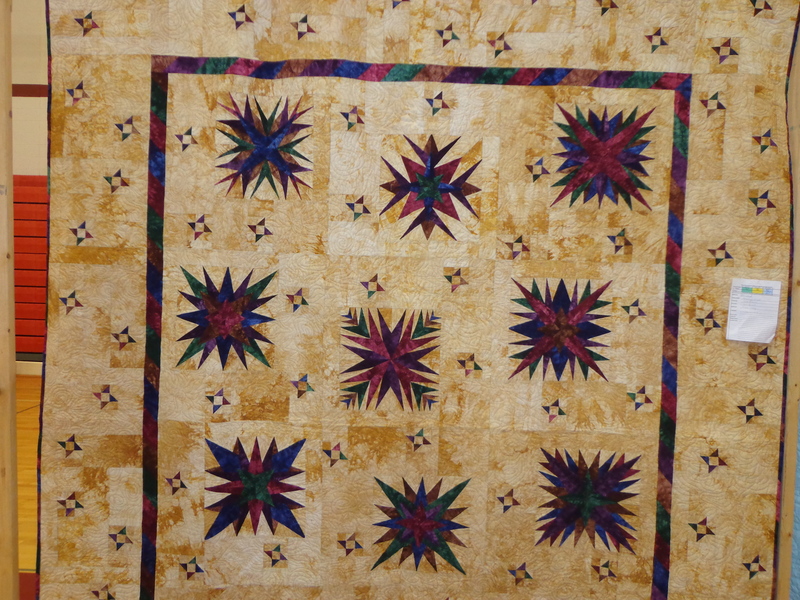 I think this was another BOM and/or class as this quilt was done in several colors throughout the year. I hope you enjoyed part 2 of the quilt show. I will try to get parts 3 & 4 & 5 done sooner, but some of it depends on upload speeds & my patience. Great photos. The one quilt that you said was similar to a Dear Jane. It looks like a SYlvia’s Bridal Sampler. Does that sound familiar to you? That sounds right. Sylvia’s Bridal Sampler. I may just leave that in the comments instead of fixing the post. Thanks. Beautiful! And quite a variety, from traditional to modern. I especially like that third one. That was a wide variety of quilts. I’m impressed. 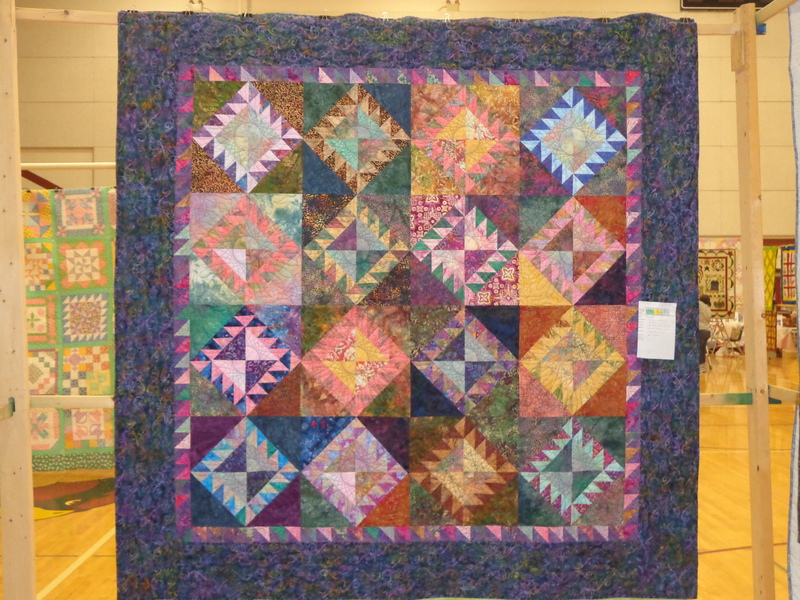 I love a good quilt show, thank you for sharing!